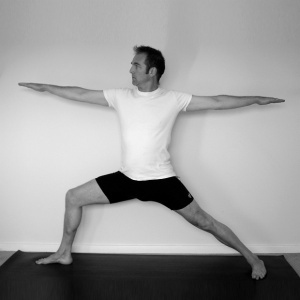 Gary Osborn-Clarke’sstyle of teaching is based on the anatomical detail of Iyengar’s style, the flow of Ashtanga Vinyasa, the mindfulness of Buddhist meditation, and traditional pranayama (breathing exercises). 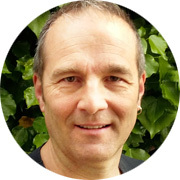 Gary has been teaching since 2002 and has practised yoga and meditation since 1995. After more than seven years of study and practice in both yoga and Buddhism, in India and other countries with various teachers, he became qualified to teach yoga after completing a one-year yoga teacher-training course at Yoga Arts, in Byron Bay, Australia, in 2002 (Yoga Alliance [500 Hours] recognised course). Gary’s yoga and meditation journey began in India, as part of his global journey which started in March 1992, when he left his journalism career in London. Once he started learning yoga and Buddhism there was no turning back and this journey kept him on the road until 2003, when he hung his backpack up and returned to live in his home city of Bristol after a 20 year absence. His first yoga class was in Kerala, south India, in March 1995 with a doctor in the village of Varkala. Over the following years he studied in various parts of India, and other countries, meeting numerous teachers, developing his understanding of yoga. It became a mission of his to learn as much about yoga as possible. He has trained in different traditions of Hatha Yoga. Principally the Iyengar style of teaching and Pattabhi Jois’s Ashtanga Vinyasa; plus Sivananda style (this was the first style he learned) and Desikachar’s teachings. Additionally, one of his principle teachers and guides to the depth of yoga has been Clive Sheridan – who teaches across the globe and is renowned expert in pranayama and meditation. Other teachers have included Glenn Ceresoli (Iyengar), Matthew Sweeney (Ashtanga), and Chris Gladwell (Ashtanga). Yoga and meditation is a personal journey and self-practice helps to deepen our understanding. As Gary travelled he practised wherever he was, from hotel rooms to the wilds of the Himalayas, Andes and tropical jungles, including periods of time in the wilderness all alone except for a yoga mat. Gary’s Buddhist journey started in Nepal in 1995 with a Goenka vipassana retreat and then a seven-month residency at Kopan Monastery, near Kathmandu, studying Tibetan Buddhism, and his Tibetan studies continued for the next four years including a year in Dharamsala, Northern India, where he also worked (as a volunteer) for the Tibetan Government-in-Exile. In 1997 he began to practice vipassana with Christopher Titmuss and other teachers, regular attending the annual January Bodhgaya retreats in India, plus retreats in Sri Lanka, Thailand, UK, France and Australia. Since 1995 he has learnt from teachers; such as Christopher Titmuss, Stephen Batchelor, Christina Feldman, and other teachers at Gaia House (Devon, UK), Bodhgaya in India, and France (all part of the Insight Meditation organisation); plus Tibetan teachers such as Lama Zopa Rinpoche (Nepal), and Tibetan teachers in Dharamsala, including the Dalai Lama. The Buddha was an Indian prince and he practised yoga on his way to his enlightenment and subsequent creation of what we call Buddhism. They are essentially one of the same thing and this is what Gary emphasises in his classes – the mindfulness associated with Buddhism mixed with the discipline of physical exercises (asanas) and breathing techniques (pranayamas). Yoga is an ancient tradition with a wisdom that is timeless. Gary believes that yoga can equip us with the tools we need to live a balanced and content life even in the modern world – whether we live the wilds of nature or a busy city. He believes that yoga does not have to feel like a foreign esoteric practice, because it offers a practical guide to living. It is not only a philosophy filled with good ideas but it also offers a “How to” guide to a better life. Respect yoga and it will respect you. 1995 to 1996 – 7 months resident in Kopan Tibetan monastery, main teacher – Lama Zopa Rinpoche. Included 2 week course, one month “November course”, and three month Vajrasattva retreat. autumn 1997 – summer 1998, autumn 1998 to spring 1999: Dharamsala, India location of Tibetan Government in Exile: attended lectures and courses at Tibetan Library; Dalai Lama spring teachings, plus other teachings and puja in various monastaries in Dharamsala. 1997 – present: several retreats at Gaia House, Devon (included one month retreats, plus three-month retreat in 1998); also attended Christopher Titmuss’ one month winter retreats in Bodhgaya, India and programmes in Sarnath, India, from 1998 to 2002. 2002: Certificate IV in Yoga Teacher Training (Yoga Alliance Registered course 500Plus hours): Yoga Arts, Byron Bay, Australia.